I will preface this review by saying that I was not in the right state of mind when I started watching this film. I was extremely tired and it did not help that the film was basically plot-less. However, I did take a break and pause 20 minutes in and continued after I felt better, and it really changed how I saw the movie. When I was watching the first 20 minutes all I wanted to do was to stop and do something else. After I came back in the right frame of mind, all I wanted was for it never end. It captivated me and it really lives the motto of “show, don’t tell”. Beau Travail literally does “Show” you what you need to understand what is happening. There are barely any words spoken throughout the film and most are not even directly impacting the story. It was a strange experience but I am glad I came back to it fresh, because you need to be in the right mind set to watch a film like this. 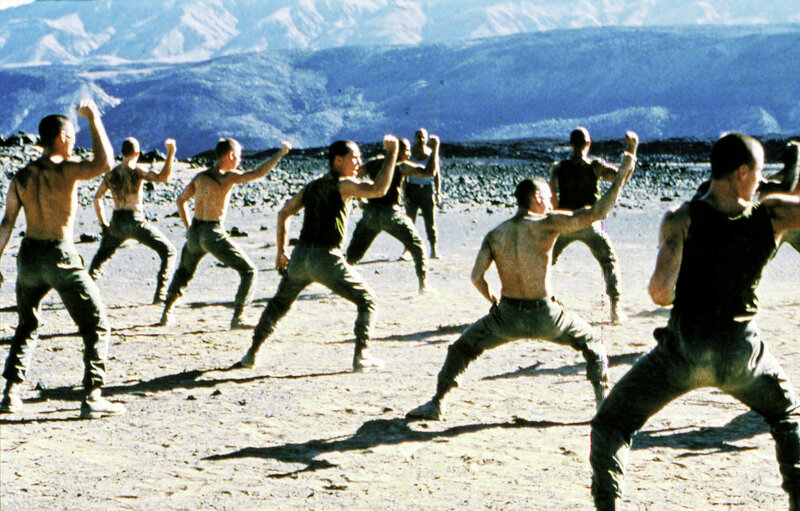 At the heart of it, Beau Travail is a film about men. It encompasses the true nature of men, especially those in the armed forces. Their world revolves around ego and showmanship. That is perfectly seen in the story of Legion Officer Galoup and his struggles when a young legionnaire shines in the eyes of his superiors. The film truly knows how to capture that feeling of jealousy, ego, and hatred through visuals. As I previously stated, there is barely any dialogue or plot. Rather Claire Denis focuses on the visual side of things in order to showcase the inner tensions between Galoup and Sentain (the young legionnaire). This is also coupled with the incredible performances of Lavant and Colin, who really managed to project what the director wanted from this story. Subtle looks and small shifts in body language are used to showcase the jealousy from Galoup and his determination to showcase his worth along with keeping his ego strong. It all plays together well, but it can easily go over someone who is not paying attention. The film relishes in the tiny details. It challenges the viewer to focus in order to find the diamonds that Denis has planted throughout the film. It is truly a strange experience, and one that definitely needs a second viewing. If there was ever a film that needed an HD remaster, it is this one. The visuals are stunning, but obviously due to fast advancement of video technology, it looks outdated. The film desperately needs a remaster and if it ever happens I will be the first one to support it. Watch this film if you are willing to take your time. If you are willing to watch it multiple times just to find that tiny detail you didn’t notice before. It is a film made with passion, and I’m glad I gave it a chance.